News of more consolidation within the online video platform space came earlier this week with the announcement that Emeryville, CA-based Fliqz has been acquired by enterprise IP video pioneer VBrick. 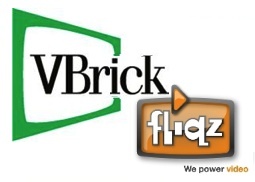 In a press release issued on Tuesday, Wallingford, Conn.-based VBrick announced that it has acquired the assets of Fliqz, and will merge Fliqz's SaaS-based online video platform with its video streaming product VBoss (VBrick's Online Streaming Service) to further grow and expand its offerings and customer base. VBrick noted that the Fliqz service "brings a strong on-demand component to VBrick’s already strong existing SaaS offering and also gives VBrick access to the small-and medium-sized business (SMB) market." While no financial terms of the acquisition were disclosed, Jonathan Marino of peHUB suggested that "Fliqz investors took a bath" and that two of his sources confirmed that Fliqz was sold for less than its three rounds of funding which totaled $12 million. Marino noted that, "one of the sources acknowledged the sale process, run through Lighthouse Capital Partners, only attracted $1.4 million from VBrick." Fliqz was founded by Benjamin Wayne in 2005 as a white-label plug-and-play video platform specializing in video SEO. Fliqz is in use by more than 35,000 websites with a wide variety customers including the US Army MLB, Monster, Rackspace, WebMD, Expedia, Sony, VH1, T-Mobile, Nokia and many others. Fliqz offers 5 different SaaS video solution packages and launched SearchSuccess in November 2009 as as an add-on to Fliqz's Gold video solution. Fliqz said that more than two-thirds of all videos submitted to SearchSuccess produce a first-page Google search result, and up to 25% have resulted in a number one Google ranking. Just two years ago, Fliqz was recognized as a "Contender" in the Forrester Research report, The Forrester Wave™: US Online Video Platforms, Q4 2009, which evaluated six leading online video platform vendors. Brightcove and Ooyala led the pack with their end-to-end product offerings that target organizations of all sizes. VMIX and Kaltura followed closely behind with comprehensive offerings and are Strong Performers, while Twistage and Fliqz served more narrow segments of the market and were noted as Contenders. Wayne received some notoriety as the "YouTube Is Doomed" guy from his Business Insider post from a few years ago. He's recognized though as an industry expert in video marketing and spoke with Reel SEO in this video about the importance of video SEO. According to Wayne, "video is fundamentally a marketing tool," and that video SEO is the "neglected gold mine" in the online space. "Fliqz was one of the early OVPs (when the term OVP was popularized) to mass-market SaaS-based B2B2C video platform services bringing the notion of using online video for marketing purposes to the forefront of corporate online marketers. In fact, I helped build the first version of this solution with Benjamin Wayne, the founder and CEO of Fliqz when he hired me back in early 2007 (I left the company in June of last year). Fliqz made it easy for businesses to integrate online video into their websites with simple to use uploading, encoding, management, analytics, and playback video content tools." Although, recently Fliqz experienced trouble raising additional funding and just wasn’t successful competing with with other larger companies, like Brightcove, Ooyala and Kaltura for VC funding. Wayne will not be staying with VBrick but according to Drey and also Ryan Lawler and Fliqz's future still looks promising. VBrick will invest $1 million into Fliqz to help integrate and build out the product offering. VBrick has also renewed the lease of Fliqz’s offices in Emeryville, CA. Fliqz will remain open and continue function temporarily as its own business unit for the next several months as its staff of 20 are retrained and folded into VBrick. Jim O'Neil spoke with VBrick CEO Doug Howard who said that, "Fliqz CEO Benjamin Wayne will help guide the transition and is expected to remain onboard for at least the next three months." VBrick currently has 9000 customers in the corporate, government and education sector and according to Howard, Fliqz will add less than $5 million in annual revenue to VBrick's estimated $45 million. "We expect to see further merger and acquisition activity in online video this year and will keep you posted on what it means for the industry. January and February have definitely set a trend pointing towards more focused and specialized business plans and product offerings." VBrick is the leader in Enterprise IP Video, with over 9,000 corporate, education and government customers and 60,000 installations worldwide. VBrick solutions work over standard IP networks and the Internet to enable the creation, publishing and distribution of rich media content. Our comprehensive streaming solutions are used in a wide range of live and on-demand applications including meeting and event broadcasts, employee collaboration, distributed learning, digital signage, TV distribution, and video surveillance. Headquartered in Wallingford, CT, VBrick’s products and services are available through industry-leading value-added resellers. In purchasing the Fliqz assets, VBrick did not assume any liability, debt or obligation of Fliqz except to the limited extent specifically agreed and specified. For more information, visit www.vbrick.com.